*about IAR: Nagoya University's Institute for Advanced Research was established to produce internationally recognized academic research of the highest caliber, and to contribute to society through the research achievements at the Institute. 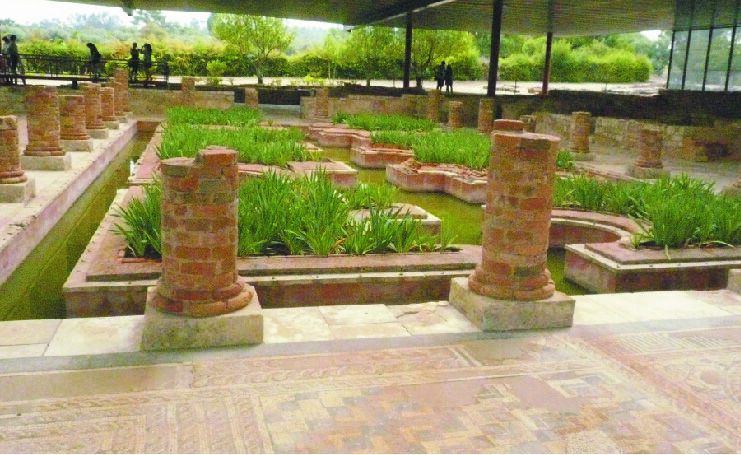 Roman city ruins (Conímbriga in Portugal). We are studying knots, which are formed by closed strings in three-dimensional space. Because of the simple structure of the knot, our knot studies relate to fields such as string theory in mathematical physics and research into knots in DNA. In fact, the knot invariant defined by the author and the knot invariant calculated by string theory coincide, and new knot invariants using category theory are applied to the structure determination of DNA knots. A knot is a closed string in three-dimensional space (Figure 1), and beautiful knots with high symmetry have been used as geometrical patterns from ancient times. 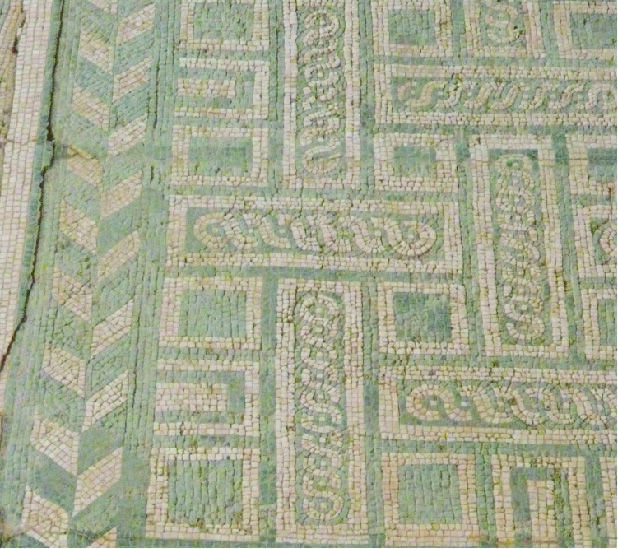 When I was a postdoctoral researcher at Algarve University in Portugal, I visited Conímbriga, the ruins of a Roman city, and found lots of knots in the mosaic floors (Figure 2). In knot theory, we treat these geometric objects mathematically and we study the classification and structure of knots. Before talking about knots, let us consider a polygon on a two-dimensional plane as a simple example. First, how many kinds of polygon exist? Their number is infinite. You all know them as triangles, squares, pentagons, etc. Another question: can we determine what kind of polygon a given polygon is? Yes, we can find that by examining the structure of the polygon. We can find the answer by examining the number of edges, the number of corners or the sum of the interior angles. For instance, if the sum of the interior angles of a given polygon is 900 degree, then the polygon is a heptagon. So what about knots? Figure 2: Trivial knots (geometrical pattern). First question: how many kinds of knot exist? We find that there is an infinite number of knots. As you can see from the first line in Figure 3, by gluing the top and bottom of two strings together, we obtain a knot that has two components that are not intertwined(left in Figure 3). If we twist the strings once and glue the top and bottom together again, we obtain a one-component knot that is topologically the same as the trivial knot in Figure 1 (middle in Figure 3). If we twist the strings twice and glue the top and bottom together, we get a two-component intertwined knot (right in Figure 3). We can obtain more complex intertwined knots by twisting the string three or four times and gluing the top and bottom together. Using three strings and four strings, more complex knots can be made. Not all knots are made in this way; there are more complex knots. This does not prove that there is an infinite number of knots, but we can understand the fact intuitively from the above. Second question: can we determine what kind of knot a given knot is? Unfortunately, we cannot always know what kind of knot a given knot is. For instance, Trefoil 2 and Trefoil 3 in Figure 1, which do not look the same at first glance, become the same knot if we use a continuous deformation without separating the knot components (please confirm this for yourself ). In addition, Trefoil 1 will not change into Trefoil 2 using a deformation. However, if you work a little harder, Trefoil 1 might be made into Trefoil 2 (do not try too hard, because these are different). That is, we need to indicate that Trefoil 1 will not change into Trefoil 2. Knot invariants are effective in proving this. In extracting the structure of a knot, we need to define a knot invariant, which is a map from the set of knots to a well-known set, and classify all knots using the knot invariant. There are knot invariants such as the Alexander polynomial and the Jones polynomial, which are maps from the set of knots to the set of one variable polynomial. How to construct these polynomials is omitted here, but the evaluations for the knots in Figure 1 are summarized in Table 1. From Table 1, the evaluations of the Alexander polynomial for the trefoil and the figure-eight knot are different and so the Alexander polynomial tells us that these knots are different. However, although Trefoil 1 and Trefoil 2 (and 3) are different knots, the evaluations of their Alexander polynomials are equal. That is, the Alexander polynomial cannot always determine whether they are different or not. In general, the Alexander polynomial cannot distinguish knots that have a mirror image relationship like the relationship between Trefoil 1 and Trefoil 2. On the other hand, Trefoil 1 and Trefoil 2 can be distinguished using the Jones polynomial (Table 1). The Jones polynomial tell us whether the knots listed in Figure 1 are equal or different. However, the Jones polynomial also does not classify all knots, because there are non-trivial knots whose evaluation of the Jones polynomial is the same as the trivial knot. Whether we can construct a knot invariant which classifies all knots is still an open problem in knot theory. Set theory deals with collections of mathematical objects. Category theory deals not only with collections of objects but also with the relationship, called a morphism, between the objects in a collection. Sometimes we explore deeper structures by dealing with objects and morphisms. Using category theory it succeeded to obtain new knot invariants. In 1999, M. Khovanov refined the Jones polynomial using a category. The refined polynomial is called the Khovanov polynomial. This is a knot invariant which is a map from a set of knots to a set of two variable polynomials. By specializing the parameter t in the Khovanov polynomial into -1, the Jones polynomial is recovered. From the evaluations of the Jones polynomial and the Khovanov polynomial in Table 1, the Jones polynomial is recovered from the Khovanov polynomial if the parameter t is specialized into -1. Moreover, the number of terms in the Khovanov polynomial for the figure-eight knot is greater than the number of terms in the Jones polynomial. The Khovanov polynomial can thus capture the deeper structure of knots. In addition, the evaluation of the Khovanov polynomial for the trivial knot is different from for non-trivial knots. That is, the Khovanov polynomial can detect the trivial knot. Developing Khovanov's research, we refined the generalization of the Jones polynomial using category theory. From its construction, it can be seen that our invariant is a generalization of the Khovanov polynomial. Moreover, our knot invariant relates to a knot invariant derived from the topological string theory method in mathematical physics. Research into refining the knot polynomial using category theory so far has been limited to refinement of the knot invariant called type A. One problem for further research is how to construct a refinement of a knot polynomial which is not type A. We are also studying a refinement of representation theory of a quantum group, which is a concept for describing the symmetry of a physical phenomenon. We are hoping that our refinement of representation theory will induce a new knot invariant and the new knot invariant will help to classify knots. 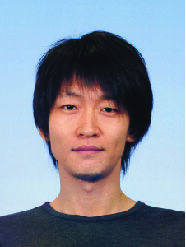 (1) Yonezawa, Y., Quantum (sl(n), V(n)) link invariant and matrix factorizations, Nagoya Math. Journal. 204, 69-123 (2011). (2) Khovanov, M., A categorification of the Jones polynomial, Duke Mathematical Journal 101 (2000) 359-426.